Hollywood Rip Ride Rockit will be a high-speed rush of first-ever maneuvers, hit music and specially created take-home videos starring each rider. These experiences have never been brought together on a coaster before – and rely on extreme technologies being used in entirely new ways. 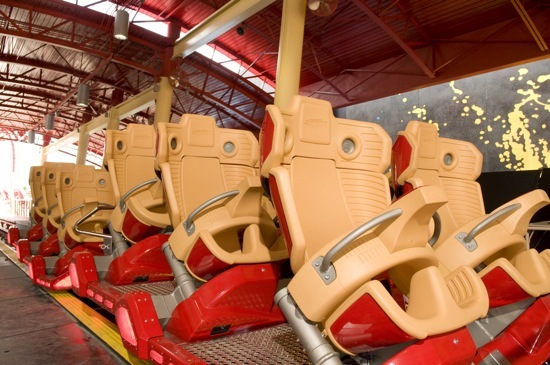 The ride vehicle is a high-performance hot rod that features a new restraint system designed to put riders closer to the experience than ever. They pick their own music using industrial-grade touchpads that operate with the sophistication of an iPod. Songs from five genres of music will be pumped through individual sound systems that rely on all-weather speakers typically reserved for high-performance sports boats. And the network of cameras that will create the guest videos are used on high-speed trains and engineered to work in the toughest conditions. Guests will slide into the bucket seat of the specially designed X-CAR. The X-CAR’s wheelbase is short enough to allow for tight, intricate maneuvers. The vehicle features stadium-style seating so everyone has an unobstructed view. And there is no over-head/pull-down restraint system. Instead, a revolutionary lap bar allows for unprecedented freedom of movement. Hollywood Rip Ride Rockit is the country’s only coaster where guests can choose the soundtrack to their ride from songs representing five different genres of music. They will use a personal touchpad – or guest interface panel – mounted on the lap bar to make their selection. The panel is designed for ease of use and visibility. It is military-grade durable and waterproof. And it uses wireless servers to upload each rider’s music pick. Each seat is outfitted with Polk Audio marine-grade stereo speakers that can push out 165 watts. Guests will rock to 90 decibels of music – and yet never hear the songs playing for other riders. This sound system – typically installed on wakeboard boats – gives riders an entirely new way to experience music. There are 14 cameras that will capture the guest experience: six on-board each ride vehicle and eight along the track. They are designed to provide production-quality footage under intense conditions. Used on high-speed trains, the digital cameras will perform at ultra-high data capture rates for up to 14 hours a day – all at variable Gs and high-speeds. A series of lasers will trigger timing devices and computers to ensure that the rider’s music and video are in sync. After the ride, each guest video is downloaded wirelessly from the ride vehicle to a viewing kiosk in 25 seconds. Guests will be able to purchase a specially edited take-home version of their experience and share it with their family and friends. Hollywood Rip Ride Rockit is the only coaster in the world with daytime LED color-changing lights. Each ride vehicle has 36 different lights that will be programmed to change color and to either be steady, strobe, twinkle, race or pulse. That means the coaster will be an ever-changing light show for those on the ground. Hollywood Rip Ride Rockit features the country’s only operating moving roller coaster load platform – meaning it uses a people-mover-style conveyer belt to get people to their vehicles so that riders and vehicles never come to a complete stop. This allows vehicles to leave the station every 23 seconds. Power gets to each vehicle’s cameras and computers via on-board capacitors that get freshly charged each time the vehicle passes through the load station – similar to how an electric subway train is powered. And finally – the brains of the system is a network of self-checking computers called Programmable Logic Controllers which constantly check the entire system and synchronize wirelessly. • Check out the point-of-view video simulation in our previous post. I’d like to check that out.